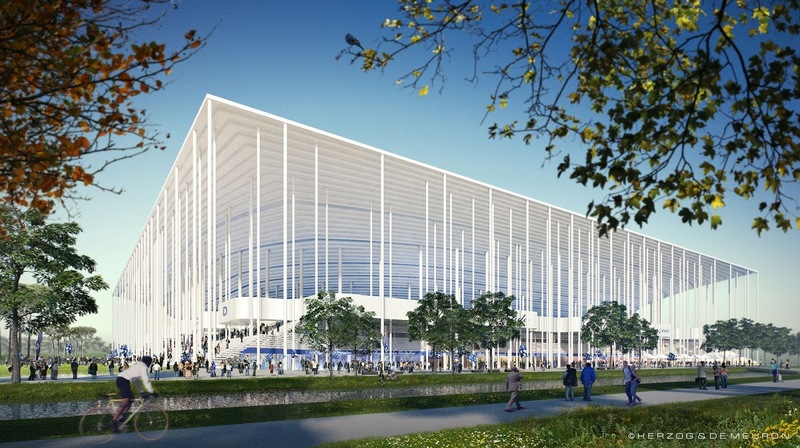 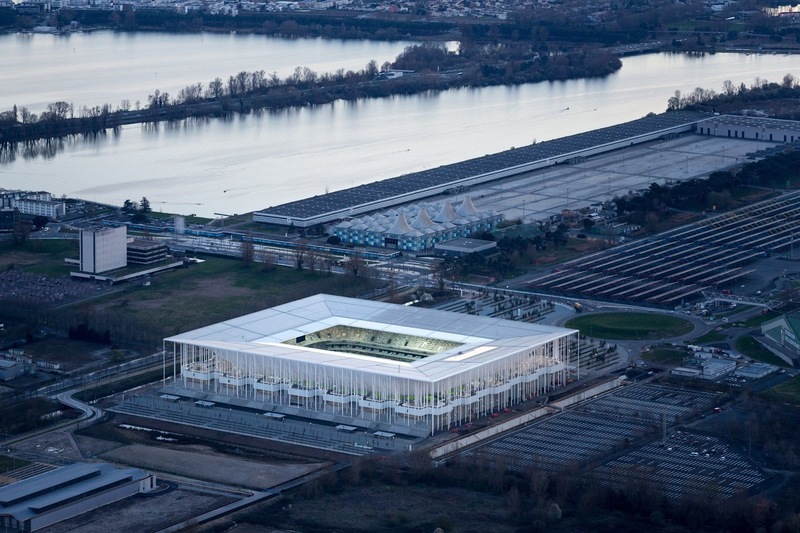 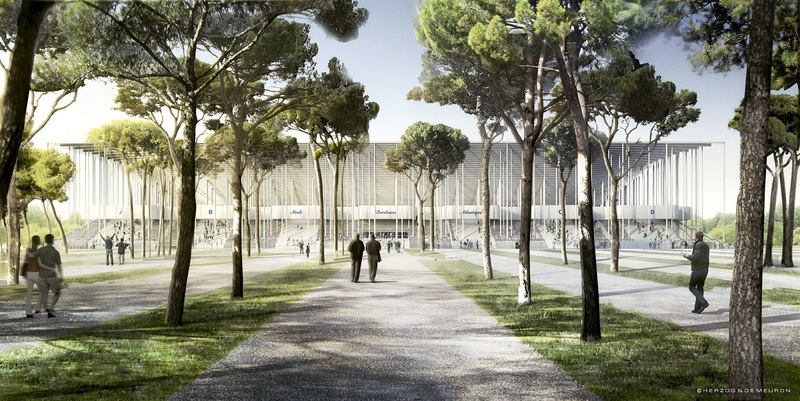 Our project for the new Bordeaux stadium is an expression of fundamentally new architecture. 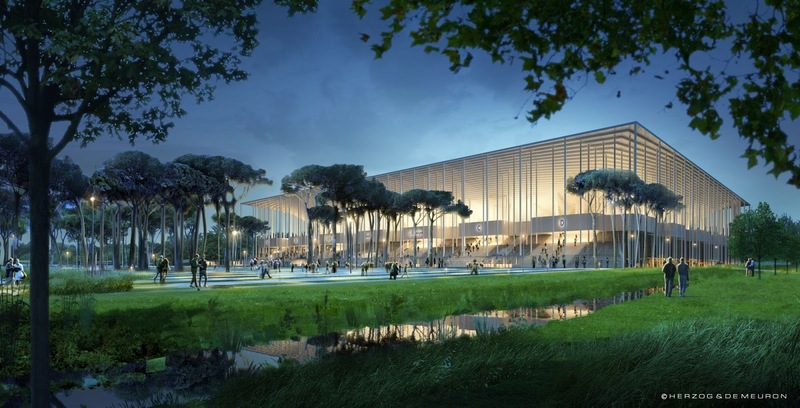 The pure shape of the volume, by contrast to its light and open structure, creates an at once monumental and graceful architectural piece elegantly suited to the grand landscape of Bordeaux. 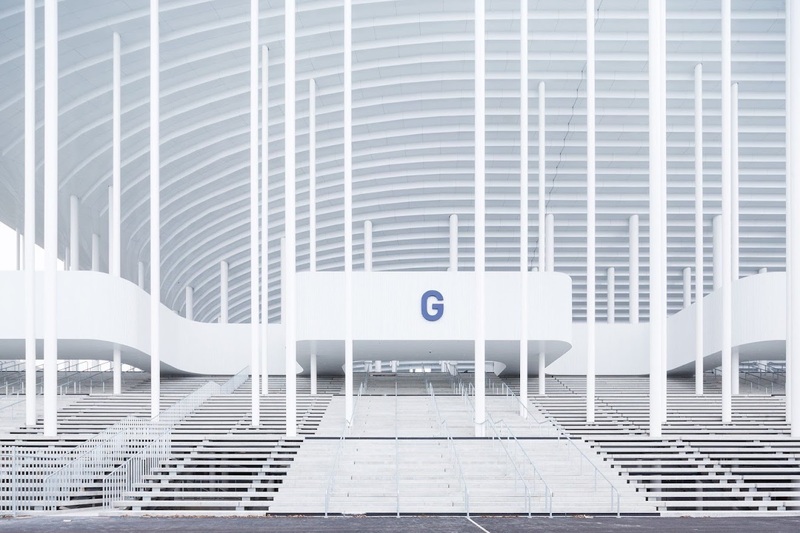 Stadium architecture combines three constitutive elements: the bowl containing the game and its spectators, the concourse as the transitional element between the playing field and the outside surroundings and, finally, the overall appearance. 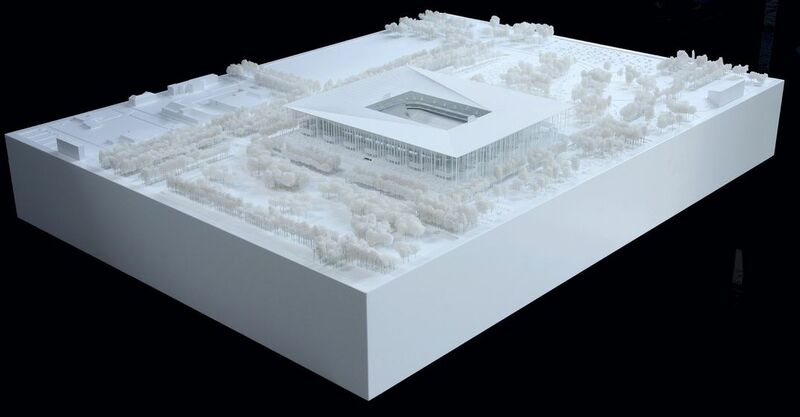 Our approach is to reinterpret these three elements in light of the site-specific characteristics: the resulting architecture is thus one-of-a-kind, reflecting the intrinsic features of the site. 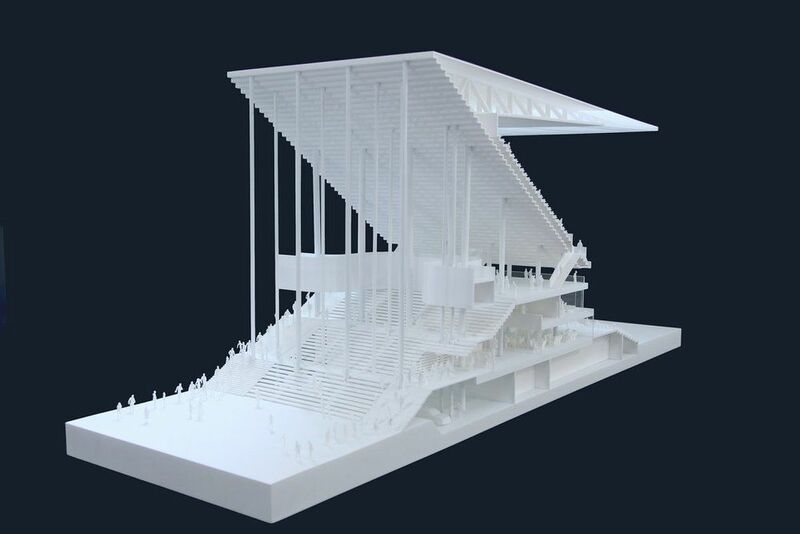 We aim to propose an architectural object in which highest functional quality is combined with a unique identity. 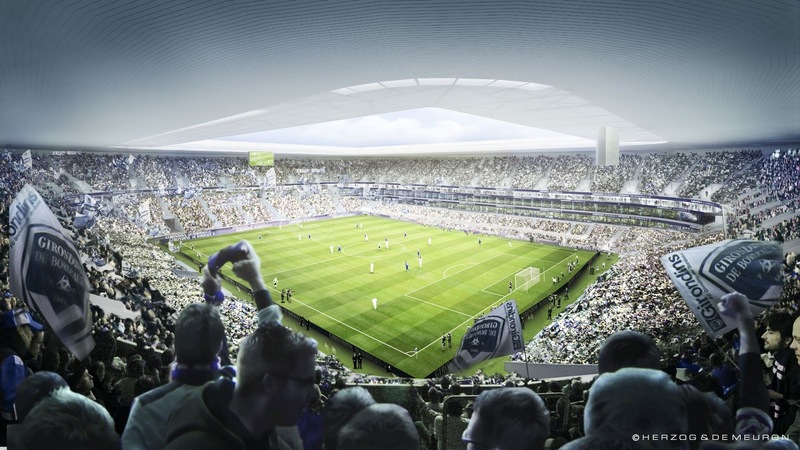 We are confident that allying these two criteria, functionality and strong identity, endows our project with an emotional dimension that the public can feel, and that is inextricably bound to the stadium’s traditional role of staging sports. 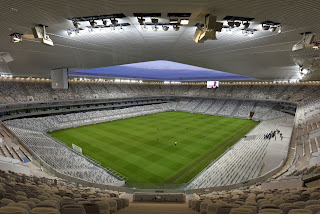 Seating a maximum of some 42,000 persons, the bowl embraces the game area, its geometry affording optimal visibility for all, together with the maximum flexibility of capacity and usage. 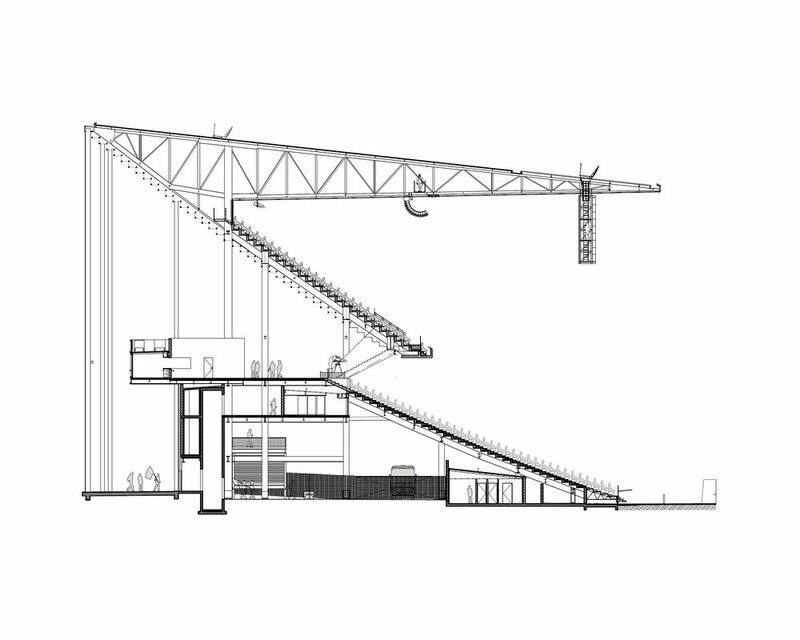 The bowl consists in two superposed tiers divided into four sectors and protected from the elements by the roof. The underside of the roof’s homogeneous appearance guides the gaze to the playing field, while allowing sunlight to pass through. 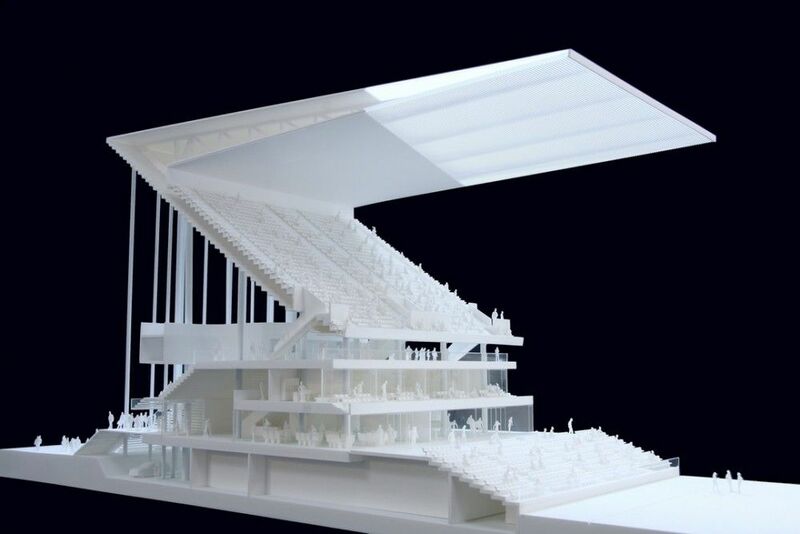 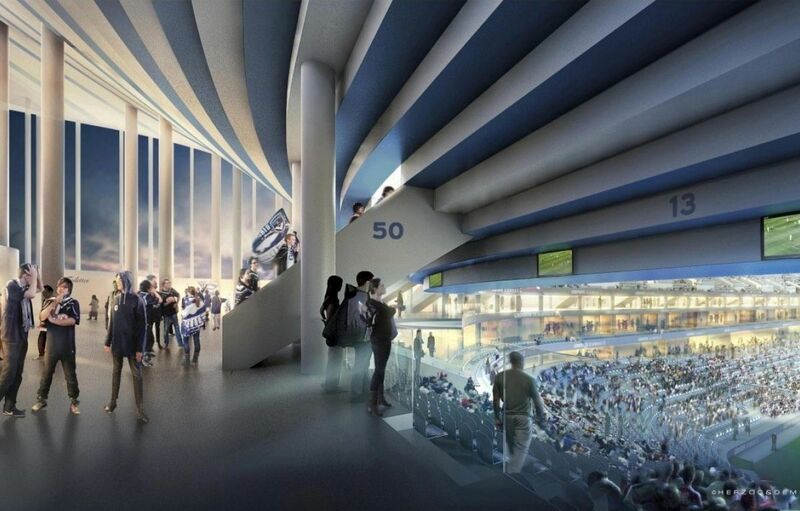 Its structure does not show through on the inside of the stadium, to avoid distracting the spectators’ attention. 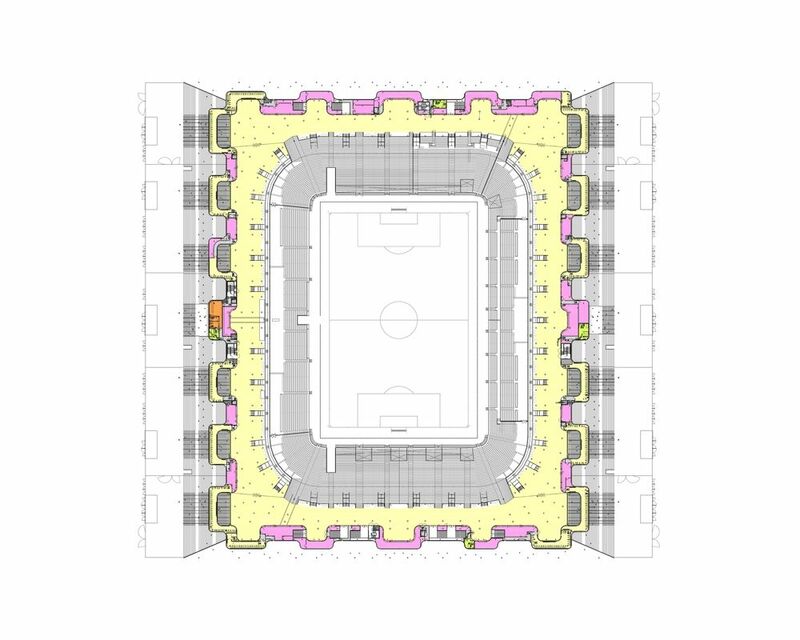 Raising the bowl above ground level is a compact base integrating all the programmatic functions into a uniform and symmetrical volume. 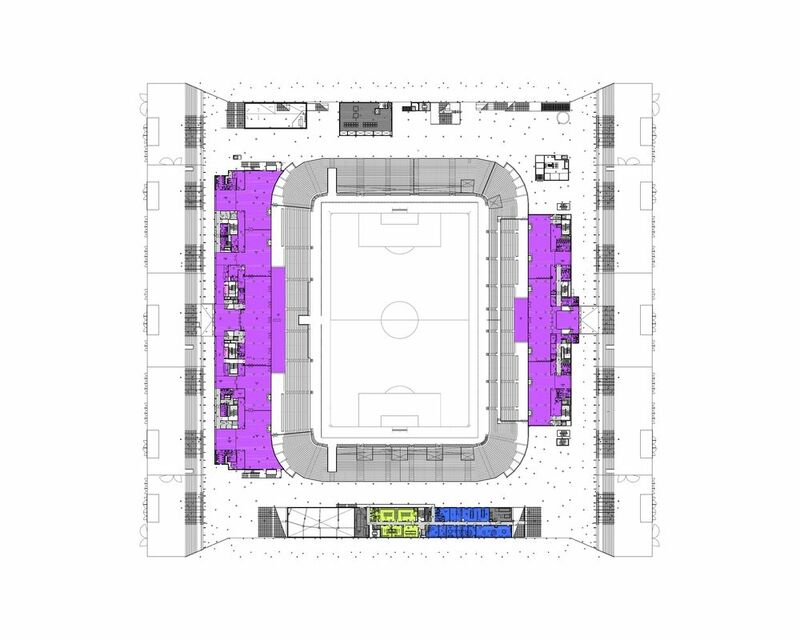 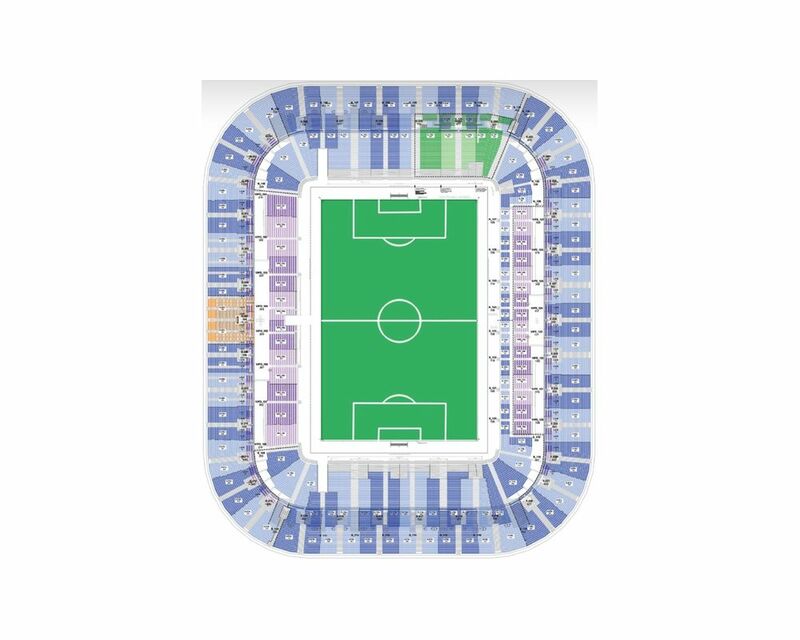 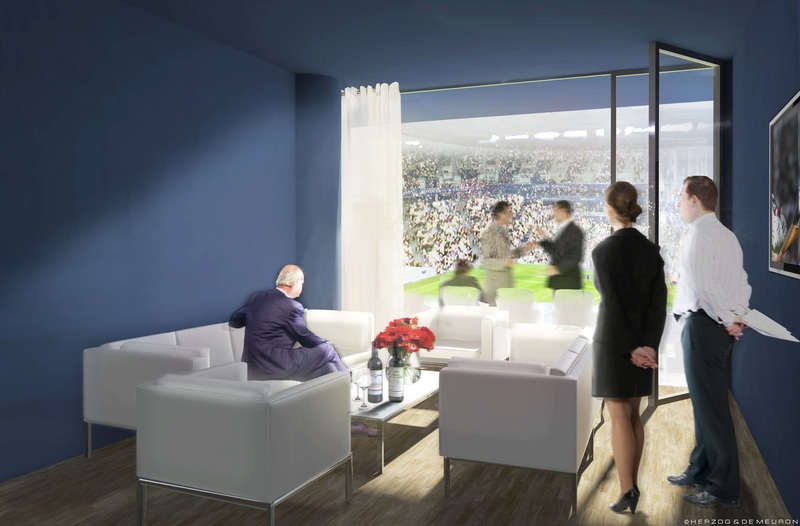 This plinth includes the VIP loges, and the salons evenly distributed east and west as well as media areas adjacent to the spaces dedicated to players. The simplicity and pure lines of the architecture characterizing the bowl and its base guarantee a smooth flow of spectators and easy orientation. The bowl rests on a plinth, covered by an elegant roof, which has a singular rectangular shape. 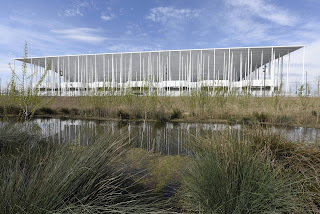 The choice of this pure and almost abstract form responds clearly and efficiently to the site’s natural conditions and to the main flow of spectators east west. 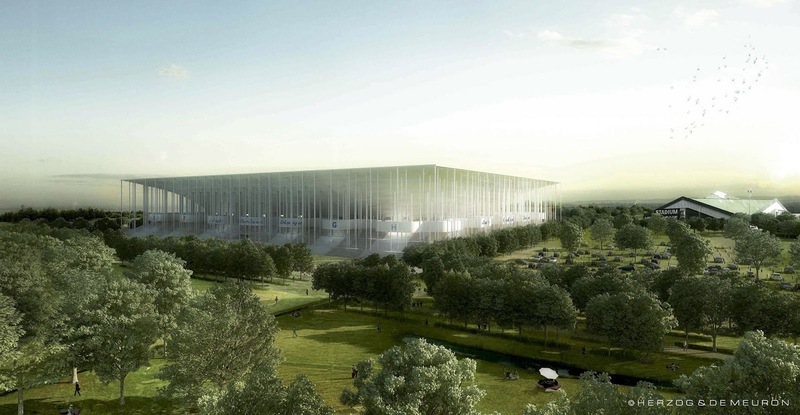 This white rectangle seems projected earthwards thanks to the multiplicity of slender columns that shower down. 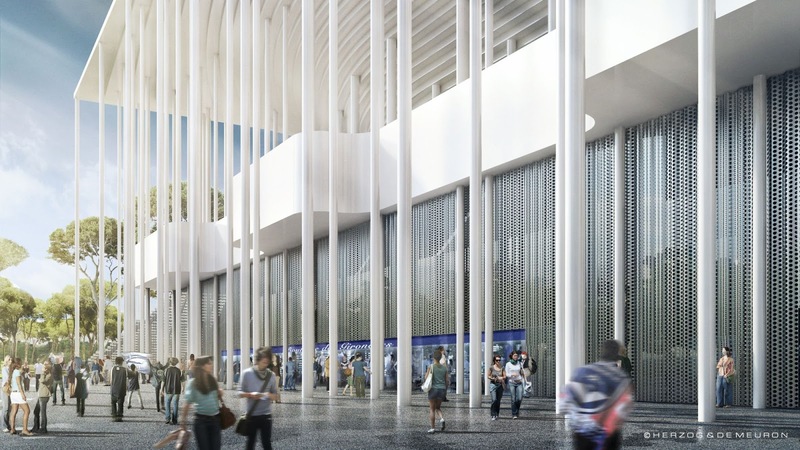 A ribbon of food stalls and restrooms undulates through this forest of columns, brought alive by the movement of the crowd. 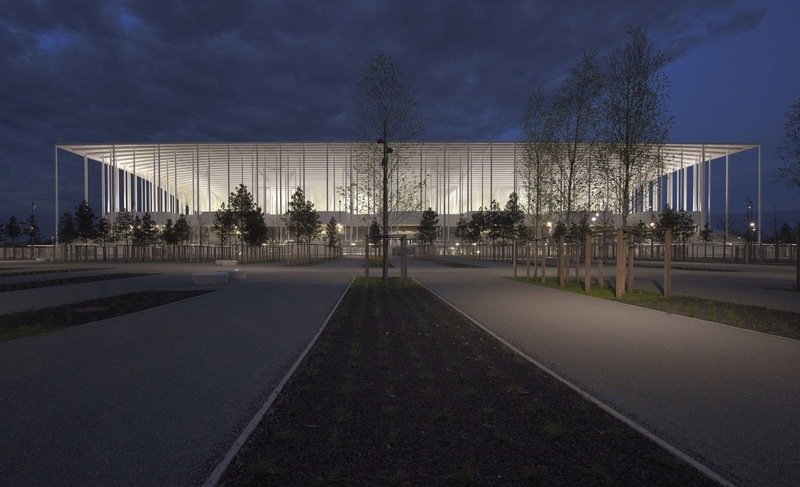 At once dense and light, this structure creates an evanescent rectangular volume from which emerges the sculpted and organic outline of the bowl. 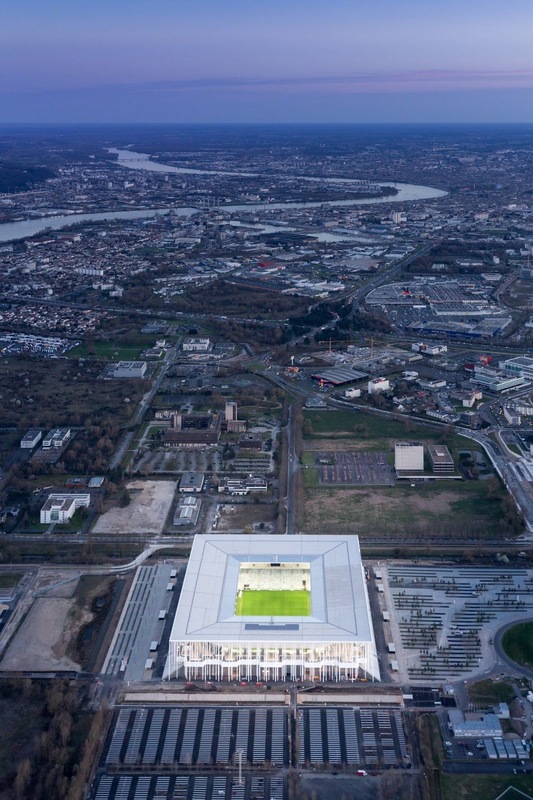 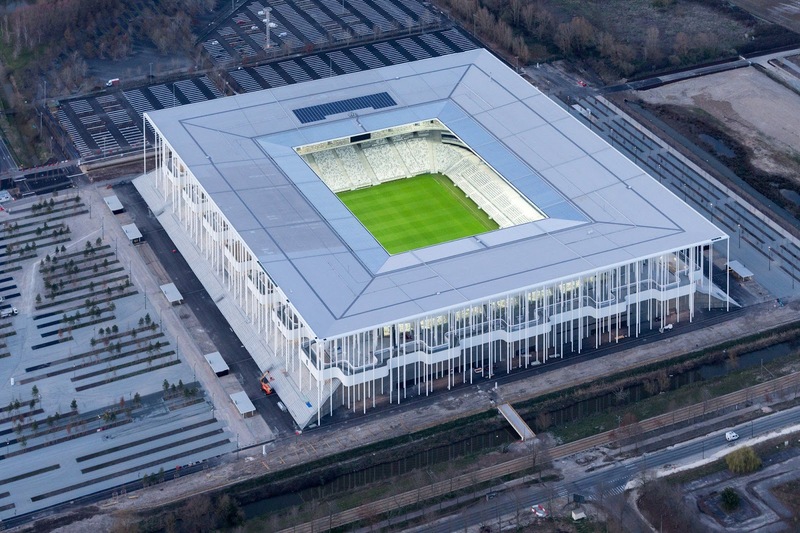 In its specificity, this architectural concept confers a strong and unparalleled identity to the new Bordeaux stadium. 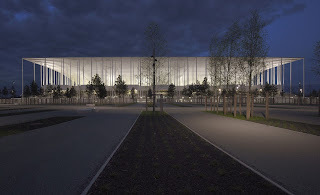 Well anchored to its site, this elegant and diaphanous volume looks out onto the grand landscape, its transparency revealing all the energy and activities, which will fill this new symbol of the city’s dynamism. 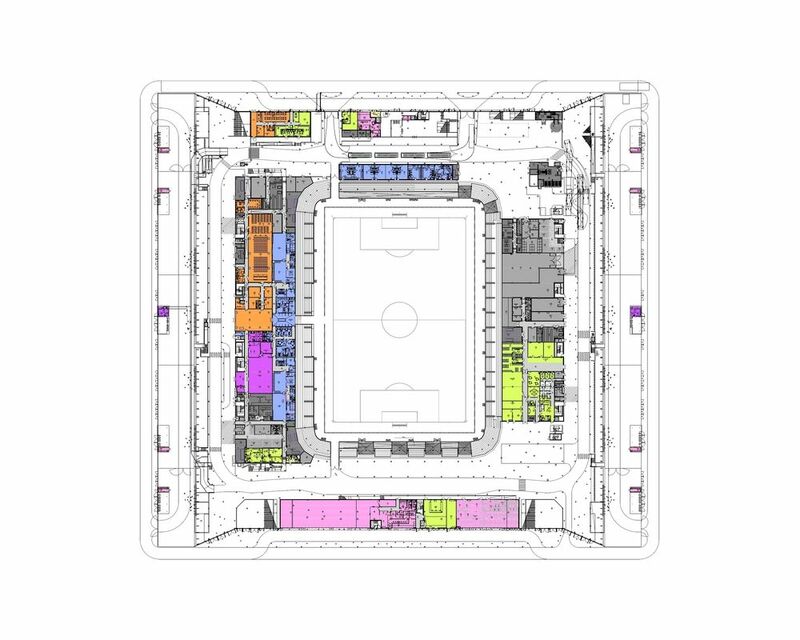 The stadium’s implantation is linked to a particular situation, serving as a juncture between a high-quality natural setting to be reinforced to the north and, to the south, a structured urban periphery area in need of new development. 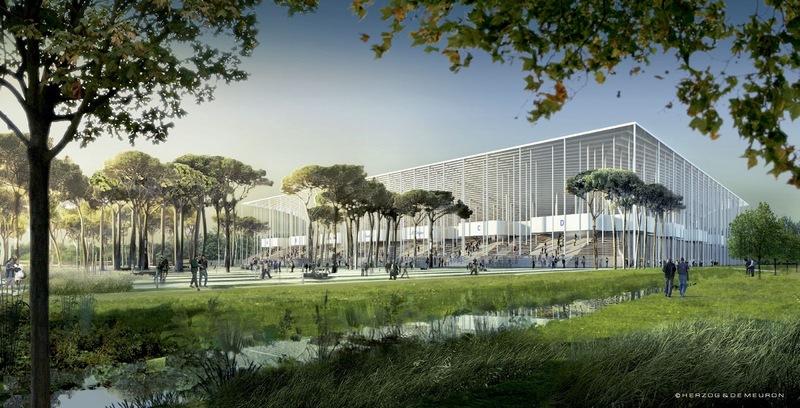 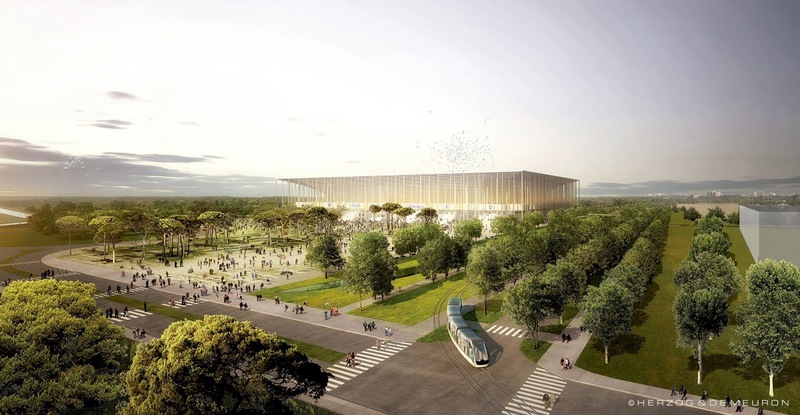 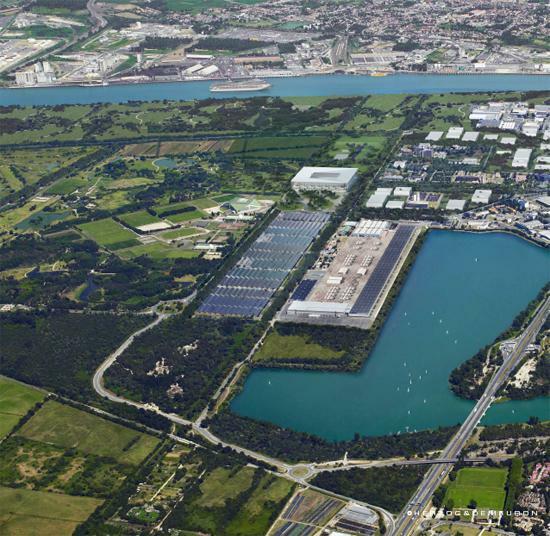 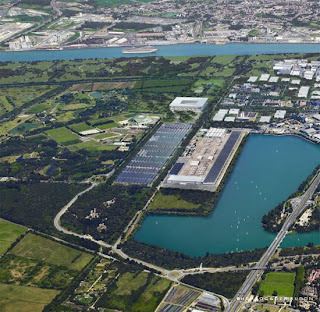 Hence, any plans for the upcoming stadium must represent a basic step towards introducing the “Nord Rocade” sector tree belt, a project already foreseen by the city of Bordeaux’s landscape development plan. 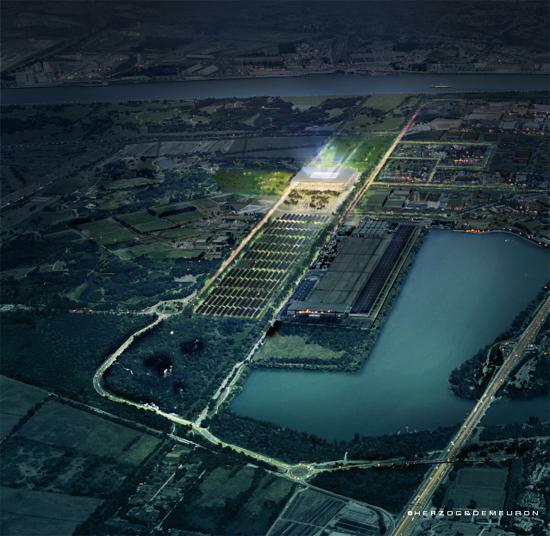 Our proposal aspires to draw up a preliminary rendition of these future developments. 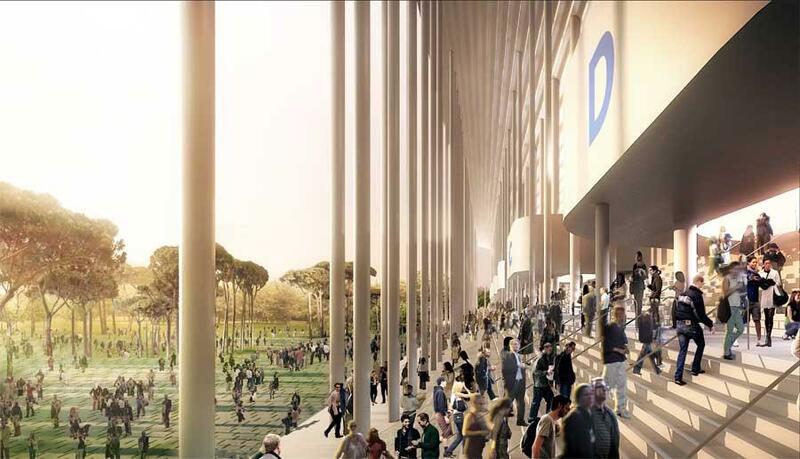 It reinterprets the tree belt’s exceptional features comprising rows of trees lining the main access ways. 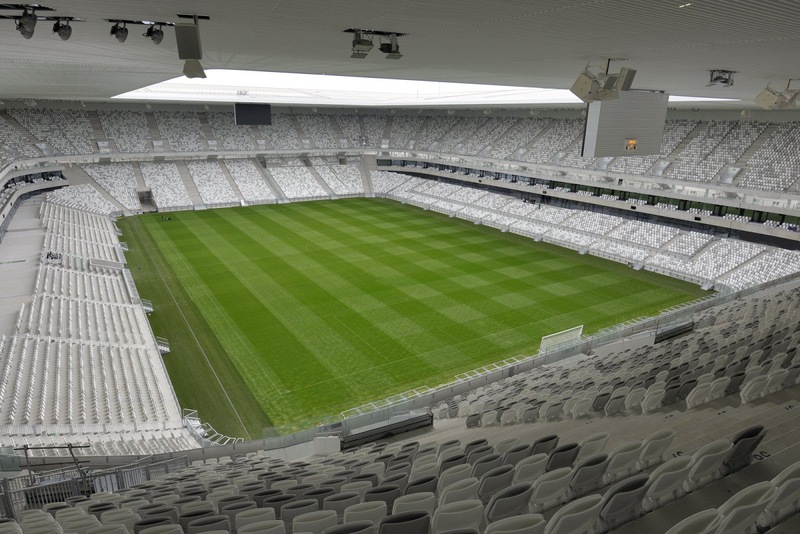 It defines an overall structure and organizes the various land plots in a grid. 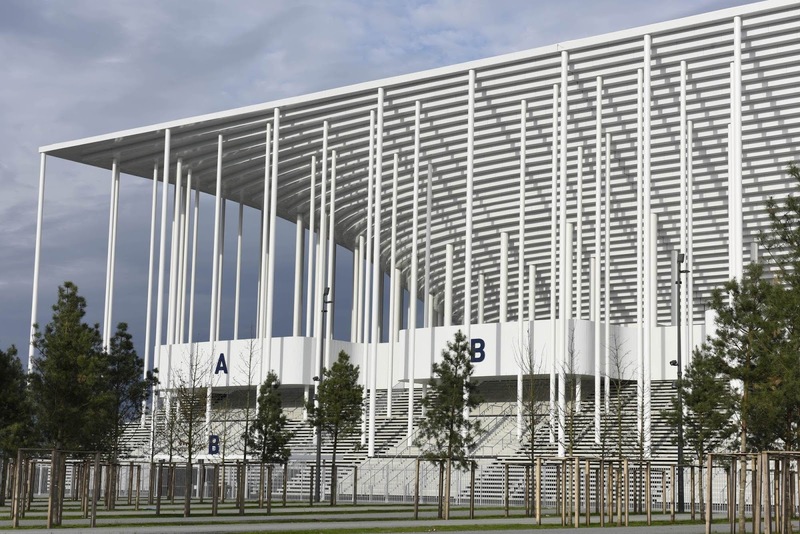 The stadium’s surrounding areas (parvis, parking areas, green corridor) belong to this language: organic tree lines serve as screens in a setting where, following the north-south orientation, they offer a variety of views while preserving a clear frontal view of the stadium’s facade. The other dominant element of the stadium’s surroundings is the ground, which presents the layering of an entirely pedestrian public area, accessible from all sides, and of a kind nature. 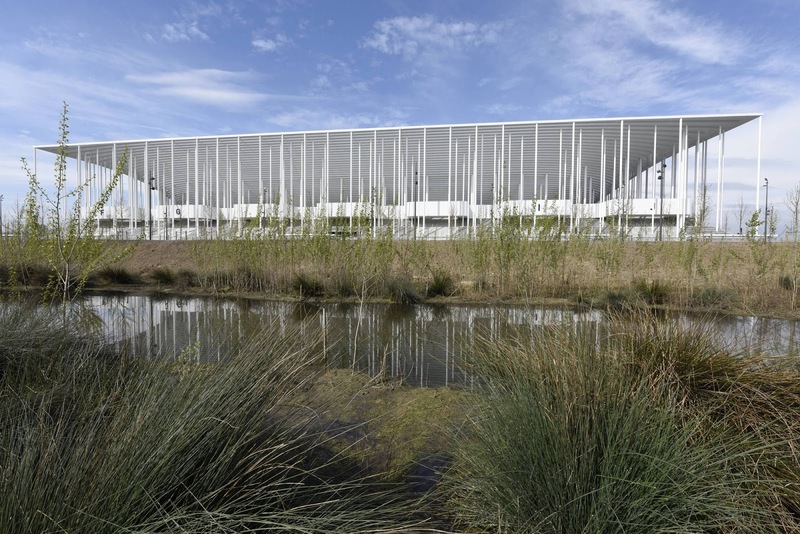 To the west, trees are included in large sections of natural lawns, themselves integrated to a simple and economic soil. 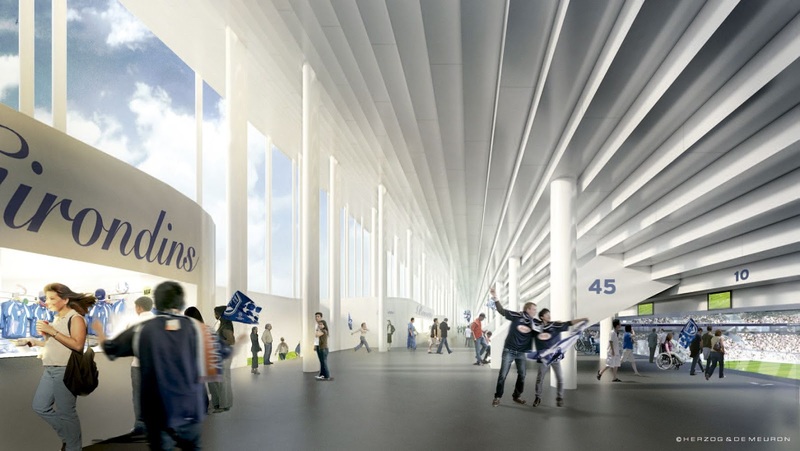 Their east west orientation allows for a multitude of paths between the stadium and the Charles Bricaud avenue. 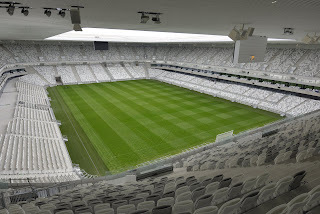 Other paths welcome the main public flows and connect them directly to the stadium’s access points. 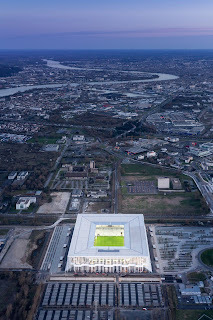 The balance between these two types of ground surfaces hides the mineral foundation of the parvis while preserving the adequate qualities required for an intense public use. 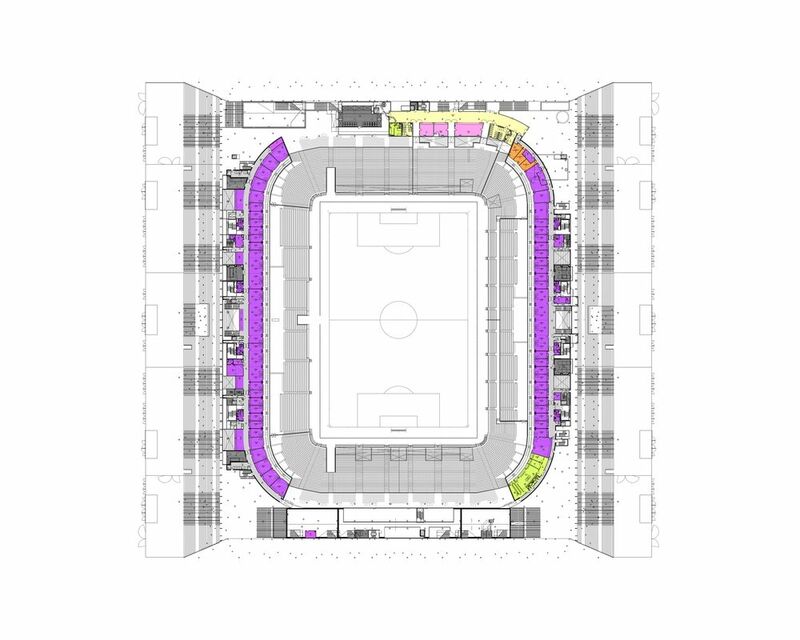 We wish for the ensemble to appear as one large united surface, unlike floor covering but like a landscape. 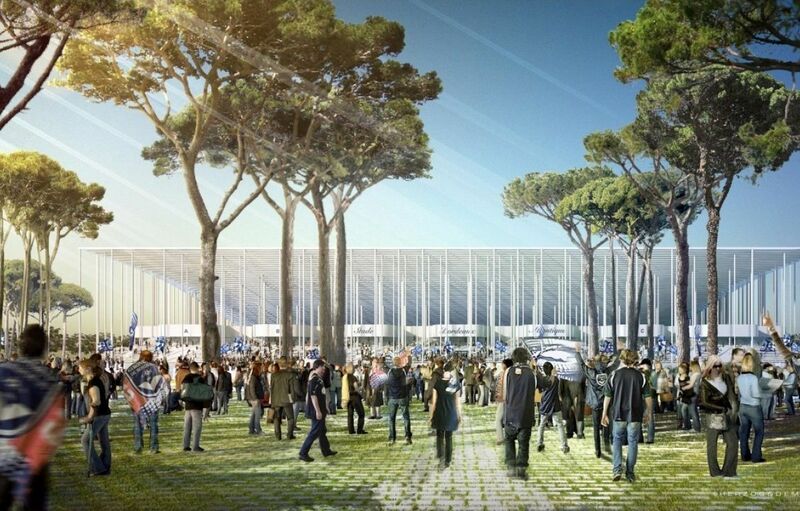 Looking ahead, the grounds surrounding the stadium will be perceived as covered with lawn and punctuated by naturalist groves. The existing north parking will be refurbished. 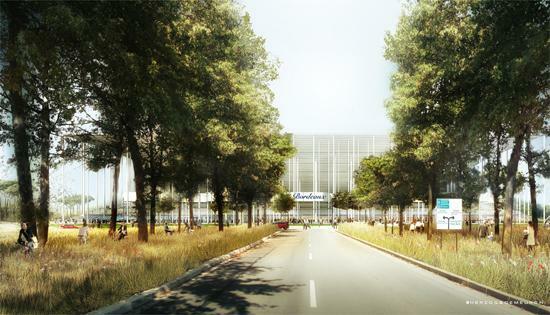 Some parking spaces will be replaced by plantations resuming the structure of the tree belt. 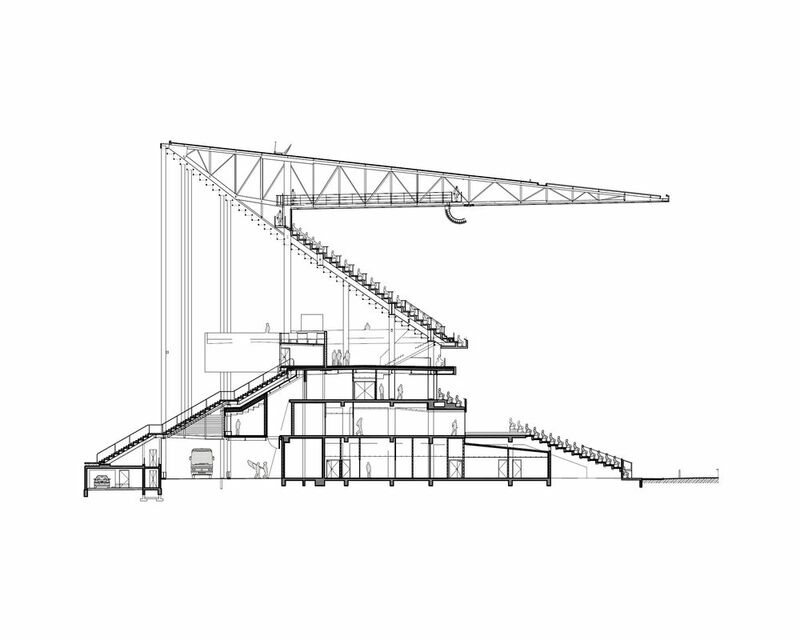 These mixed typologies set the stadium within a defined landscape, closely correlating the stadium site with its surrounding woodland setting.